Is the bounty hunter's target really an innocent woman? Convinced her sheriff brother-in-law murdered her sister, Jamie Carter hides her six-year-old niece away until she can prove his crimes. Bounty hunter Zack Owen is bound by the law to turn her in, but Jamie's story sways him to protect her instead. On the run together, Zack must face the personal price of falling for his fugitive. 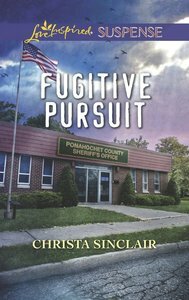 About "Fugitive Pursuit (Love Inspired Suspense Series)"
Christa Sinclair moved from New England to escape the harsh winters and settled in Texas once she received her Master's Degreenbsp;in Education. When she's not teaching high school English or traveling around the world, she's creating brave new characters who overcome danger to find love and to make sure the good guys always win. Find out more about Christa at www.christasinclair.com or follow her on Twitter at @writercsinclair.